Earlier in this series we looked at a new holistic approach to supply chain finance. Here we describe the underlying core capabilities required to implement this new approach. In Part 3 of this series we discussed benefits of implementing holistic supply chain finance, including improvements to continuity of supply, time-to-market, and postponement of differentiation. In Part 4 here, we outline the foundational capabilities required to implement a holistic approach to supply chain finance. Shared network platform—many-to-many connectivity with shared database, visibility, integrated into the P2P lifecycle. Executional framework—workflow engine, document and payment automation, and supplier compliance tools. Shared legal framework—binding legal agreements, automated guaranteed payments, connected financial institutions, competition for providing financial services. Many-to-many connectivity—A point-to-point approach quickly becomes overwhelming and economically infeasible with more than a small handful of trading partners. A single network that connects all parties is required, as illustrated in Part 1, Figure 2, Unifying Network of Participating Parties. Granular, robust security—With everyone on the same network, including competitors, security is paramount. The network must allow private networks to coexist on it, connecting each business to its specific trading partners and service providers (carriers, banks, etc. ), with fine-grained control over who is allowed to see what. All messages and stored data should be strongly encrypted and sensitive transactions should require 2-factor authentication. 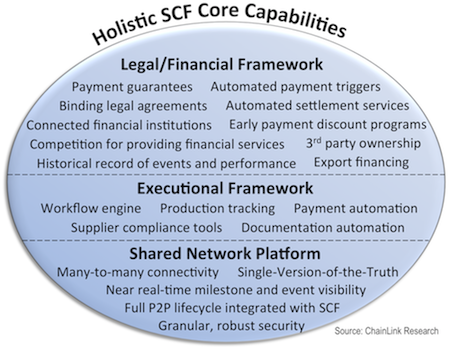 Full P2P lifecycle integrated with SCF—The platform should support the full purchase-to-pay lifecycle, from capturing the purchase order all the way through to settling the payment. Supply chain finance should be tightly integrated into the P2P process to reduce to nearly zero the friction and effort required to obtain financing. Single-Version-of-the-Truth (SVoT)—Once data is entered into the system, it should never have to be re-keyed.1 The data from the P.O. should automatically flow into creating shipping documents, which are in turn automatically used in creating the invoice. At any point in time, all participants see exactly the same data about what was requested, planned, and actually executed, dramatically reducing disputes about what actually happened. Near real-time milestone and event visibility—Mechanisms are in place to record events and milestones in near real-time. These milestones can include raw materials ordered, production milestones, shipments made, goods received, and so forth. Authorized users (with appropriate security rights) can subscribe to see whichever events are relevant to them. When events occur, including exceptions like damage to goods, or items failing inspection, the same data is visible to all who have the authority to view it. Binding legal agreements—A shared legal framework should also be in place, providing a set of consistent, legally binding agreements between all parties specifying when payments will occur and funds transferred, when title is transferred, what triggers payment and title transfer, and other pertinent details. This is conceptually similar to credit card networks, where cardholders, merchants, and banks all have a consistent set of agreements with the network provider, thereby reducing uncertainty and risk for all involved. Connected financial institutions—The network needs a critical mass and variety2 of lenders already connected. In particular, providing good global coverage for pre-shipment financing requires having enough financial institutions able and willing to serve suppliers in each of the markets where the suppliers reside. Lenders should only have to set up and connect once, rather than requiring them to connect one-by-one with prospective borrowers. Competition for providing financial services—Mechanisms should be in place to allow open competition and bidding for lending money and providing other financial services (e.g. payment guarantees). This competition is key to driving down interest rates and service costs. Historical record of events and performance—Authorized parties with a need to know should be able to view performance of suppliers, payment history of buyers, and other data pertinent to gauging and reducing risk for lenders. Automated Payment Triggers—The system should be capable of triggering title transfer and payments based on any data-verifiable conditions specified in the PO, validated by documents such as cargo receipt, warehouse receipt, inspection certificates, and so forth. Automated Settlement Services—The network platform should support automated transfer of funds between buyers, sellers, and financial institutes at the precise date as driven by the agreed terms and actual performance/events that trigger payment. This should include the ability to support complex payment scenarios, such as when a lender provides financing for only partial value of a shipment. In that case, the system should automatically keep track of and make the correct payment amount to the lender and to the supplier, as well as automatically paying out all the various fees, service charges, chargebacks, and deductions. Early payment discount programs—The platform should provide mechanisms for both buyer-funded and lender-funded early payment programs, including dynamic discounting. Buyers and suppliers should be able to define rules to automate their participation in these programs. Export Financing—The platform should make it easy for suppliers to issue requests for pre-export and post-export funding to lenders. It should also give lenders full visibility into suppliers’ past performance and visibility into the specific current relevant events as they occur (e.g. firm order received from buyer, production milestones achieved by supplier, order shipped, etc. ), thus creating confidence for the lender to provide lower cost financing based on the buyer’s credit risk. Payment Guarantees—Mechanisms for payment protection should be made available at competitive rates for performing suppliers. These protect the supplier—if they perform as stated in the PO and the buyer doesn’t pay (e.g. for bankruptcy or any other reason), then the supplier can collect their payment from the guarantor. This replaces the need for costly Letters of Credit or Credit Insurance and is a valuable service for suppliers that have bank covenants that limit the supplier’s per country and per buyer exposure. Third Party Ownership—The network should provide mechanism for a title to temporarily pass from the supplier to a third party before the goods are ultimately owned by the buyer. This is required in different scenarios, such as when a trading company takes title to the goods and then flips the order. It is also useful for letting third parties offer to take ownership of inventory in-transit or VMI/consigned inventory sitting in a VMI hub or retail store. Workflow engine—To drive timely execution and completion of milestones throughout the P2P and financing process, a rules-based workflow engine is needed that automates the steps and provides escalation when activities and events are not completed on time. Production Tracking—Tools to automatically track progress on suppliers’ production lines, including alerts to manage by exception; sending alerts the moment potential schedule issues arise. It is critical that these tools (and other supplier tools listed below) are as easy as possible for suppliers to implement and use, since many suppliers are not technologically sophisticated. Documentation Automation—To the maximum extent possible, documentation is generated and validated automatically, such as first sale documentation, automatic creation of the ASN, invoice generation, and so forth. Supplier Compliance Tools—Beyond documentation automations, the platform should provide suppliers with tools to increase compliance, such as compliant ticket and label printing and application, scan-based (i.e. using barcode or RFID) picking and packing compliance, tools for tendering loads that comply with buyer’s routing guides, customs compliance tools, and so forth. All data flows from the original P.O. and ship data to create the labels and auto-populate the ASN, pack manifest, and commercial invoice, ensuring compliance. These help streamline supply chain performance, reduce chargebacks, and reduce delays in customs clearing. From a pre-shipment financing perspective, these reduce supplier non-performance risk as well. Payment Automation—Automated rules-based ‘N-way’ matching3 comparing orders, invoices, packing lists, proof of delivery, inspection certificates, and goods receipts to ensure date-certain payment to suppliers and lenders without manual intervention required. In the fifth and final installment of this series, we examine some of the operational and strategic benefits of implementing holistic supply chain finance.